Have you ever tried washing away a stubborn stain on your shirt? The type which simply refuses to vanish in spite of the rigorous scrubbing you do and vast amounts of cleansing chemicals you apply? These types of stains can only be removed by laundry or fabric professionals. Nevertheless, there are times when even the professionals are unable to wash away such stubborn stains. 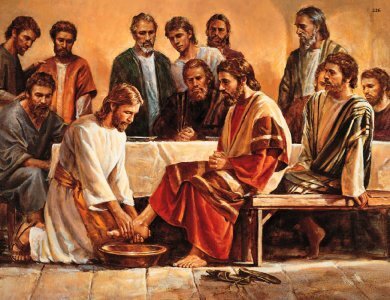 When Jesus was about to wash Peter’s feet, the latter refused because he felt unworthy to be washed by Jesus, his Lord. However, Jesus replied to him, “Unless I wash you, you have no part with me.” As a result, Peter told Jesus that He could wash his entire body as well! Jesus then said to Peter that only his feet needed washing because he was already clean, but that there was someone in the room with them who was not clean, and that was Judas Iscariot. In this account of Jesus washing His disciples’ feet, we can clearly see that Jesus not only meant physical washing but also spiritual washing. As human beings, we have been stained with original sin that only Jesus can wash away. No amount of good works on our part can cleanse us from unrighteousness but only the precious blood of our Lord Jesus Christ which He shed on the cross for the forgiveness of our sins. The Apostle Paul wrote to the Ephesian church that we have been saved by grace through faith and not by works (2:8-9). Therefore, let us thank God in faith with sincere hearts for the washing of rebirth in Christ Jesus our Lord.